Sift the powdered sugar into a bowl and make a well in the middle. Next, put the marshmallows in a pan. (Tear them in half first, it helps them cook better.) Add the milk, butter, and vanilla, then cook over low heat and stir while cooking. Watch to see when everything is melted; at that point, remove from heat and pour the mixture into the well in the powdered sugar. Mix everything together, then add a drop of food coloring and mix. Leave to cool for 10 minutes, then spread out into a flattened round. Wrap in plastic wrap and refrigerate for at least three hours. Sprinkle powdered sugar over a work surface and roll out the fudge with a rolling pin to 1/4 inch. Cut shapes out with the cookie cutters, then re-roll the scraps and make more shapes. Decorate with candies. NOTE: Try making this recipe half at a time, except on one half DON'T add the food coloring. 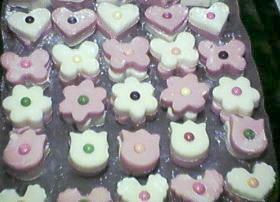 Then you can have some white, some pink fudge. The fudge should be refrigerated in an airtight container and eaten within a week.